This is an order for Custom Japanese Art Framed and on handmade Japanese paper. 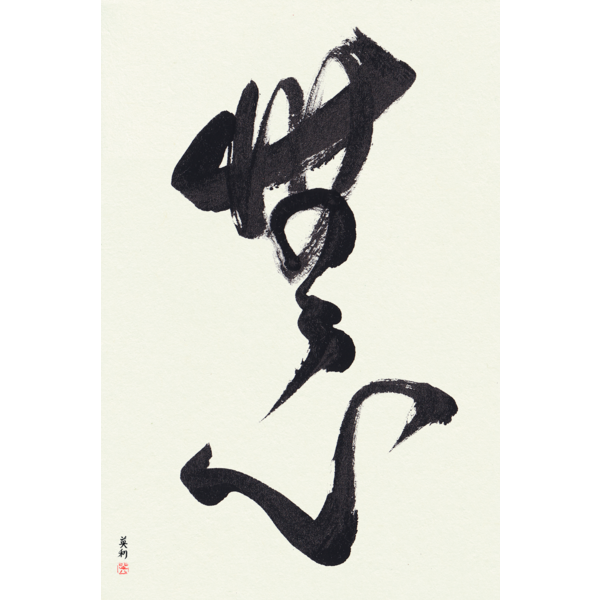 You will be working directly with Master Takase to create a unique work of Japanese Calligraphy Art. The art is created on beautiful handmade paper that we import from Kochi Japan. The frame has the outside dimensions 16″ W x 20″ H (40.6 cm wide x 50.8 cm high) and the hand-made paper is 12″ W x 18″ H (30.5 cm wide x 45.7 cm high). The art is protected with acid-free backing and acid-free double mat with a white outer mat and black inner mat. Finally, the art is covered with high-quality non-glare conservation glass and a metal semi-gloss black frame. Once the final design is decided, the art is completed, framed, and shipped within 1-3 business days. The art arrives ready to display. Framed art may only be shipped to US addresses. 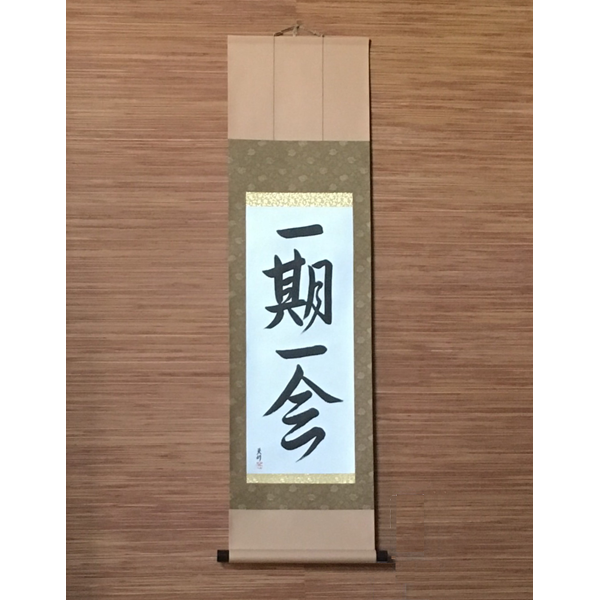 When we receive your Custom Japanese Calligraphy Art order, Master Takase will create the first sample set focusing on the translation and showing different fonts and layouts. This way you have original samples to look at as we discuss the translation and begin to think about the font and the layout. We welcome questions and will provide you with as much information as you need to be completely comfortable with the translation. And we do have native English and Japanese translators which are a must for accurate translations. 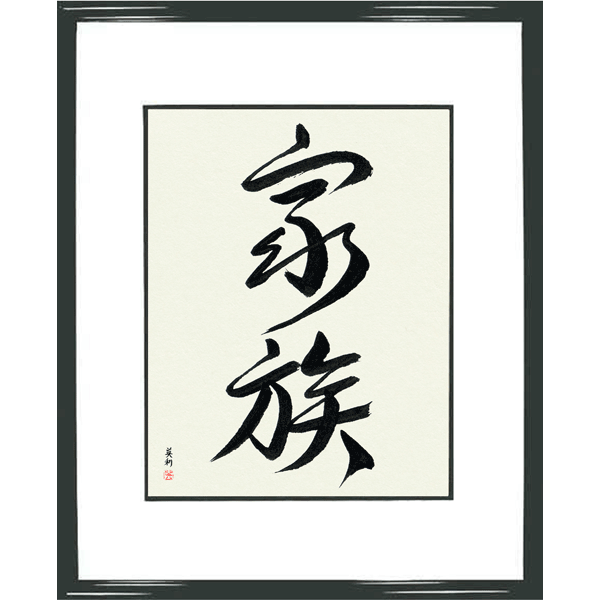 And based on your feedback we create another sample set and we continue in this fashion until your Custom Japanese Calligraphy Art is exactly the way you want it. This normally takes two or three sets to get just right. The whole process is meant to be informative and fun. You patiently worked with my almost three years back in getting correct character and meaning. My children are Yonsei, and to pay homage to what I have been removed from and what seemed to fade along the way, I named my son Hitoshi after my father and grandfather, and my daughter Hikari. There was no personal reference to advise, but you were able to use your wisdom, creativity, and experience to translate their names into beautiful pieces of art. Thank you. I was very pleased with the entire process of ordering and the final product that was send. Eri provided an excellent communication and guaranteed to have my order shipped in time. The Calligraphy that I received was amazing and it arrived in a very well protected packaging. I can only recommend this site. We have received the artwork and it is beautiful! Thank you for the prompt response and your insights that make this 25th anniversary gift very special.